Currently, dozens of our more than 115 volunteers meet twice monthly to make blankets that are donated to local non-profits working with children, adults, and families in crisis. 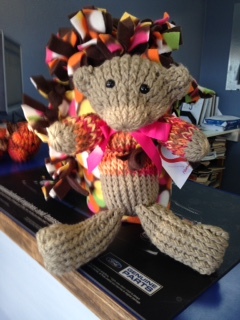 Three of our volunteers donate loom-knitted bears, each with a special and lovable personality. These bears are bundled with the children’s blankets. Working with Oregon’s Social Service Departments, we also donate blankets each month to newly diagnosed adult cancer patients at Bend and Redmond St. Charles Medical Cancer Centers and Bend Memorial Clinic. 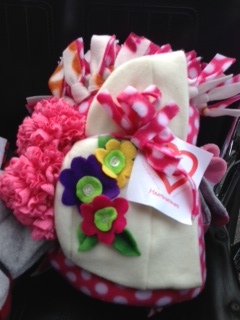 These blankets are accompanied by hats and scarves also made by volunteers from our leftover fleece. Volunteers also donate lotion, women’s socks and men’s bandanas that are tied with the blanket. These are the organizations that help us spread warmth to those who could use it.